Osmerus (Spirinchus) lanceolatus egg lectin (OLL) is a member of the rhamnose-binding lectin (RBL) family which is mainly found in aqueous beings. cDNA of OLL was cloned, and its genomic architecture was revealed. The deduced amino acid (aa) sequence indicated that OLL was composed of 213 aa including 95 aa of domain N and 97 aa of domain C. N and C showed 73 % sequence identity and contained both -ANYGR- and -DPC-KYL-peptide motifs which are conserved in most of the RBL carbohydrate recognition domains. The calculated molecular mass of mature OLL was 20,852, consistent with the result, and 20,677.716, from mass spectrometry. OLL was encoded by eight exons: exons 1 and 2 for a signal peptide; exons 3–5 and 6–8 for N- and C-domains, respectively. 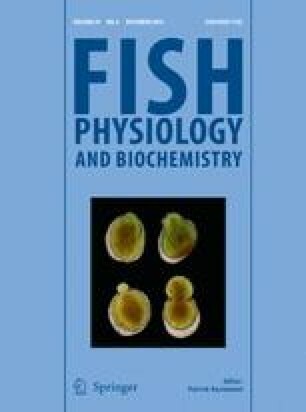 Surface plasmon resonance spectrometric analyses revealed that OLL showed comparable affinity for Galα- and β-linkages, whereas Silurus asotus lectin (SAL), a catfish RBL, bound preferentially to α-linkages of neoglycoproteins. The Kd values of OLL and SAL against globotriaosylceramide (Gb3) were 1.69 × 10−5 M for and 2.81 × 10−6 M, respectively. Thus, the carbohydrate recognition property of OLL is slightly different from that of SAL. On the other hand, frontal affinity chromatography revealed that both OLL and SAL interacted with only glycolipid-type oligosaccharides such as Gb3 trisaccharides, not with N-linked oligosaccharides. The domain composition of these RBLs and an analytical environment such as the “cluster effect” of a ligand might influence the binding between RBL and sugar chains. The nucleotide sequence reported in this paper has been submitted to the DDBJ/EMBL/GenBank Data Bank with accession number AB047559 and AB444586. The online version of this article (doi: 10.1007/s10695-013-9814-6) contains supplementary material, which is available to authorized users. A part of this work was supported by a Grant-in-Aid for Frontier Research Program from The Ministry of Education, Culture, Sports, Science, and Technology of Japan. We thank Dr. Stephen Anderson for editing of the manuscript.